Melissa and Doug 6724 - Help your child cultivate an interest in the natural world while cultivating the garden! Kid-size watering can from the Sunny Patch line. Encourages fine and gross motor skills, balance, and interest in outdoor play and the natural world. Decorated with flowers and hearts. Made of light and durable materials. How does your garden grow? by keeping it watered with this sweet, that's how! 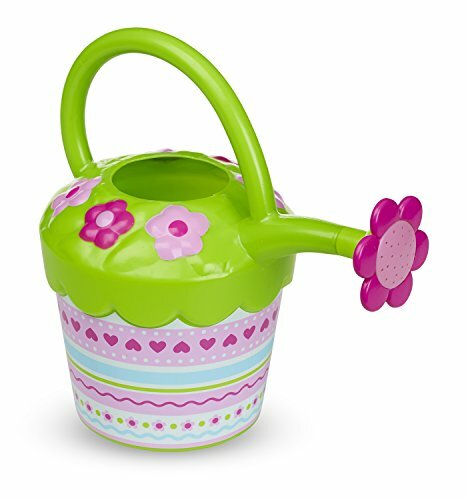 This Pretty Petals-themed can with curved handle and flower-shaped spout is made from light but sturdy plastic that holds up to outdoor play, while encouraging creative and imaginative pretend play, kid-friendly watering can, too. Pretend Play Toy - Melissa & Doug Sunny Patch Pretty Petals Flower Watering Can - . Suitable for pretend play and garden use. Melissa and Doug 6702 - Garden tools--shovel, rake, and spray bottle--made of easy-clean plastic. With this kid-friendly garden tote, complete with tools, getting help in the garden just got easier! The sturdy plastic tools are just right for little helpers and easy to keep organized in this durable and brightly colored fabric tote with woven handles.
. Brightly patterned tote, complete with child-sized garden tools. Tote made of durable fabric. An included spray bottle helps keep plants watered and little gardeners cool! Use it inside for pretend play or outside when kids want to do some digging. Encourages imaginative play and develops gross and fine motor skills. Melissa & Doug Sunny Patch Pretty Petals Gardening Tote Set With Tools - For ages 3 years+. Melissa and Doug 6752 - Sized to fit ages 3-6. Machine washable, sturdy cotton construction. Promotes gross and fine motor skills, hands-on exploration, and outdoor play. Garden tools--shovel, rake, and spray bottle--made of easy-clean plastic. Tote made of durable fabric. Sporting bright stripes and butterflies, these gloves, sized to fit ages three to six, high-quality, are made from sturdy, machine-washable material and feature elastic wrist closures to keep dirt out. Encourages imaginative play and develops gross and fine motor skills. Protect young hands and make gardening extra-colorful with these child-size gloves. Add instant beauty to any gardening job while encouraging outdoor exploration and promoting gross and fine motor skills. Butterfly-themed cotton gloves. For ages 3 years+. Melissa & Doug Cutie Pie Butterfly Gardening Gloves With Elastic Wrist Closure - . Keep young hands clean and protected. Brightly patterned tote, complete with child-sized garden tools. Melissa and Doug 6715 - With the pretty petals sprinkler, the flowers water you! This sweet and whimsical outdoor sprinkler features pretty pink flowers on a green base, all made from durable materials. Brightly patterned tote, complete with child-sized garden tools. Promotes gross and fine motor skills, hands-on exploration, and outdoor play. Encourages imaginative play and develops gross and fine motor skills. Machine washable, sturdy cotton construction. Outdoor fun for the entire family. The sprinkler encourages outdoor active play and helps develop coordination. Children's sprinkler. Features 12 pretty Petals flowers that each squirt water. Keep young hands clean and protected. Melissa & Doug Sunny Patch Pretty Petals Flower Sprinkler Toy With Hose Attachment - Promotes outdoor active play and develops coordination. Sized to fit ages 3-6. It attaches easily to a hose for outdoor fun for the whole family, as well an adorable way to water the garden. For ages 3 years+. Constructed from durable materials for outdoor use. Butterfly-themed cotton gloves. Melissa and Doug 6717 - Promotes outdoor active play and develops coordination. Sturdy metal scoop and easy-to-grip plastic handle. Promotes gross motor skills, hands-on exploration, and outdoor play. Sized to fit ages 3-6. Outdoor fun for the entire family. Constructed from durable materials for outdoor use. Garden tools--shovel, rake, and spray bottle--made of easy-clean plastic. Children's sprinkler. Keep young hands clean and protected. Features 12 pretty Petals flowers that each squirt water. Brightly patterned tote, complete with child-sized garden tools. Butterfly-themed cotton gloves. For ages 3 years+. Includes a handy loop for hanging. Tote made of durable fabric. Ages 3+; approximately 9 inches 22. Melissa & Doug Pretty Petals Trowel Garden Tool - 86cm long. Machine washable, sturdy cotton construction. A sturdy metal scoop, a cheerful flower design, and bright colors on the easy-clean handle make gardening activities exciting and enjoyable! stores neatly with a handy loop for hanging. Encourages imaginative play and develops gross and fine motor skills. Melissa and Doug 6707 - Ages 3+; approximately 8 inches 2032cm long. Sturdy metal tines and easy-to-grip plastic handle. Constructed from durable materials for outdoor use. For ages 3 years+. Sturdy metal digging prongs, a sweet flower design, and bright colors on the easy-clean handle make gardening activities exciting and enjoyable! stores neatly with a handy loop for hanging. Sized to fit ages 3-6. Includes a handy loop for hanging. Ages 3+; approximately 9 inches 22. 86cm long. Promotes outdoor active play and develops coordination. Brightly patterned tote, complete with child-sized garden tools. Outdoor fun for the entire family. Includes a handy loop for hanging. Promotes gross and fine motor skills, hands-on exploration, and outdoor play. Melissa & Doug Pretty Petals Cultivator Garden Tool - Sturdy metal scoop and easy-to-grip plastic handle. Garden cultivator with flower theme. Tote made of durable fabric. Butterfly-themed cotton gloves. Features 12 pretty Petals flowers that each squirt water. Melissa and Doug 6754 - Sturdy metal tines and easy-to-grip plastic handle. Features 12 pretty Petals flowers that each squirt water. For ages 3 years+. Garden trowel with a flower theme. Garden tools--shovel, rake, and spray bottle--made of easy-clean plastic. Machine washable, sturdy cotton construction with rubber latex coating on the palms. Coating makes it easy to grasp garden tools while keeping hands clean. Sized to fit ages 3-6. Tote made of durable fabric. Ages 3+; approximately 9 inches 22. 86cm long. Promotes gross and fine motor skills, hands-on exploration, and outdoor play. Outdoor fun for the entire family. Sturdy metal scoop and easy-to-grip plastic handle. Melissa & Doug Dixie and Trixie Ladybug Good Gripping Gardening Gloves - Butterfly-themed cotton gloves. Promotes gross motor skills, hands-on exploration, and outdoor play. These fun and useful gloves keep hands clean while encouraging outdoor exploration and promoting gross and fine motor skills. Machine washable, sturdy cotton construction. Includes a handy loop for hanging. Melissa & Doug 6251 - Garden trowel with a flower theme. Promotes gross motor skills, hands-on exploration, and outdoor play. For ages 3 years+. Keep young hands clean and protected. Pink ladybug-themed child-sized gardening gloves. Sturdy metal scoop and easy-to-grip plastic handle. Garden tools--shovel, rake, and spray bottle--made of easy-clean plastic. Constructed from durable materials for outdoor use. Fun will bloom in an instant when this beautiful bouquet of flowers is connected to your garden hose. Sturdy metal tines and easy-to-grip plastic handle. Promotes gross and fine motor skills, hands-on exploration, and outdoor play. It’s easy to keep cool when this sprinkler goes into action! Brightly patterned tote, complete with child-sized garden tools. Melissa & Doug Sunny Patch Blossom Bright Sprinkler - Sized to fit ages 3-6. Sprinklers feature Sunny Patch Friends. Children's sprinkler. Ages 3+; approximately 9 inches 22. 86cm long. Keep children cool and entertained for hours. Melissa & Doug 6232 - Outdoor fun for the entire family. Sized to fit ages 3-6. Constructed from durable materials for outdoor use. Sturdy metal scoop and easy-to-grip plastic handle. 3+ years. With this kid-friendly garden tote, complete with tools, getting help in the garden just got easier! The plastic tools are just right for little helpers and easy to keep organized in this durable fabric tote with sturdy woven handles. Garden tools made of easy-clean plastic. Promotes gross and fine motor skills, hands-on exploration, and outdoor play. Garden cultivator with flower theme. Promotes gross motor skills, hands-on exploration, and outdoor play. Promotes outdoor active play and develops coordination. Keep children cool and entertained for hours. Melissa & Doug Sunny Patch Blossom Bright Gardening Tote Set With Tools - Ages 3+; approximately 9 inches 22. 86cm long. Promotes gross and fine motor skills, hands-on exploration, and outdoor play. Promotes gross motor skills, hands-on exploration, and outdoor play. Machine washable, sturdy cotton construction. Garden tools--shovel, rake, and spray bottle--made of easy-clean plastic. Melissa and Doug 6711 - Tote made of durable fabric. Promotes gross and fine motor skills, hands-on exploration, and outdoor play. Sweet and sturdy child-sized garden rake with a flower theme. Garden cultivator with flower theme. Tote made of durable fabric. Brightly patterned tote, complete with child-sized garden tools. Surface cleanable. Melissa & Doug Sunny Patch Pretty Petals Rake Toy - 32cm long. Brightly patterned tote, complete with child-sized garden tools. Garden tools--shovel, rake, and spray bottle--made of easy-clean plastic. Pink ladybug-themed child-sized gardening gloves. Children's sprinkler. Melissa and Doug 6038 - Product Dimensions : 9. 25 x 6. 25 x 4. 75 inches. Machine washable, sturdy cotton construction. Encourages outdoor activity. Keep young hands clean and protected. Cutie pie butterfly ball is perfect for throwing, catching, kicking and bouncing activities. Includes a handy loop for hanging. Garden cultivator with flower theme. Promotes outdoor active play and develops coordination. Tote made of durable fabric. Sturdy metal tines and easy-to-grip plastic handle. Sprinklers feature Sunny Patch Friends. Includes a handy loop for hanging. Sunny patch's cutie pie butterfly makes it extra fun for kids ages 2+ to learn and practice early catching and kicking games. Melissa & Doug Sunny Patch Cutie Pie Butterfly Classic Rubber Kickball - Garden tools made of easy-clean plastic. Metal prongs and brightly painted wooden handle. Surface cleanable. Promotes gross and fine motor skills, hands-on exploration, and outdoor play. Ages 6+; 8" wide x 45. 75" tall. Pink ladybug-themed child-sized gardening gloves.